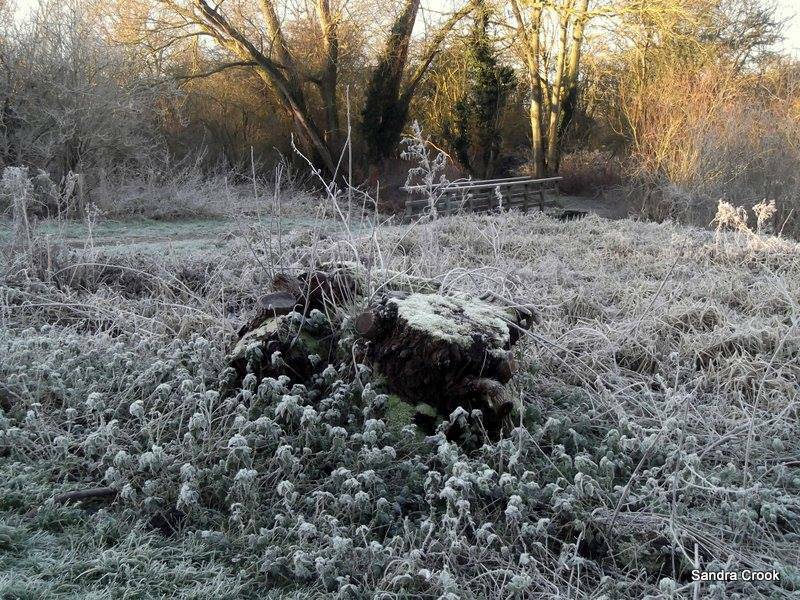 Richard laid branches in a wide circle on the frozen grass; then the skeletons of old Christmas trees which Flora’s father had stuffed behind the shed every January; and finally a layer of straw, like a bed. Almost comfortable. Flora would never be ready, but she bent to lift her end. Her father’s body was heavier than she had imagined, and she and Richard had to swing it three times. Richard held out the matches, but Flora shook her head. Instead she watched the white grass around the edge of the fire melt into green and then blacken, as if seasons had passed in the space of a minute. A piece flash fiction which is supposed to be 100 words, but I’m 112 this week, oh dear. Usually I can slice and edit with no problem, but this week somehow everything here I wanted to keep. Friday Fictioneers is brought to us by the wonderful writer Rochelle Wisoff-Fields, and the picture this week is supplied by the equally wonderful writer, Sandra Crook. Click here to join in with Friday Fictioneers, or here to read other people’s. Tin House, my US publisher has posted the first chapter of my novel, Our Endless Numbered Days, on their blog. Have a read, if you like. I like it. I think they’d need some kind of accelerant, but dumping a can of petrol would make this a very different sort of story. When I get pressed for words, I generally restructure my sentences to get rid of conjunctions. Sometimes this approach has led me to a different style. It’s a fantastic exercise. I like how you made the funeral bier almost as comfortable as a bed with skeletons of Christmas trees. Lovely piece. Thanks Alicia. Glad you liked it. I love the skeletons of Christmas trees – it’s almost as if he left them for this reason. There’s so much in the last sentence: Flora’s grief, a life gone too quickly. Great piece! Thanks Sonya. Yes, I always say things are 30% writing, 70% revising. Glad you liked it. Really lovely, every word of it. A beautiful piece, and the perfect title. As if seasons had passed in the space of a minute. Thanks Liz, really pleased you liked it. i liked the last sentence, too. it’s beautiful. it’s very original. I can see why you want to keep all the words. They are lovely and said it all. And I keep mixing my tenses…very big sigh. Hah! Not to worry, I know what you meant. Thanks for reading and commenting. This was a really good piece, even if you did go over! I sometimes agonize over making that brutal cut and hate to remove a sentence I really enjoyed constructing but in the end I have to comply! I don’t know why, its not like I am going to get arrested but I just can’t go over the limit. I know! I usually do, but when I wrote this I was short of time, and it probably wouldn’t have been another hour working out what to change or what to cut. Beautifully written …What a lovely and passionate scene. You have a knack for taking me to places I’ve never gone before. I think I even felt the flames warming my feet and ankles. No surprise at how well done it is. I loved every word! This is exquisite..
Lovely writing, Claire. You really drew me in with this. Congrats on your book! I’m so happy for you. Thanks Amy, for reading, commenting and the congratulations! I know. There needs to be a pause in there while Richard lights the fire, but I was already too many words over. At least you got what was going on. And thanks for pointing it out – constructive criticism is always appreciated from you, Sandra. It is a pleasure reading your work. A gentle and tender snapshot of a loving farewell. Great last line. Perhaps I’ll try and do 99 words for the next two months! Viking-esque – I like it! There are so many things I love about this story.. that single scene told me so much, like the keeping the old Christmas trees said something about the father, and the fact that they build a pyre for him in the backyard.. somehow I want to know more. Beautiful, and what Björn said. I’m intrigued why they burn the father outside instead of some kind of funeral. I’m also intrigued how they burn the ‘junk’, the old Christmas trees, like cleaning the place (through fire). Me too! I’ve yet to work it all out. Thanks for reading and commenting; glad you liked it. This piece is so realistic, I could hear and feel the fire. I love your writing because it always pulls me right in, Claire! Wonderful story. Thanks Dawn, glad you liked it. I think it’s worth the extra words. Your twelve extra words added only light, not weight. They were necessary. Very touching, evocative writing, Claire. That’s a kind thing to say. Thank you, Erin. A lovely piece. Intriguing that the body had to be burned. Your words are luscious, descriptive, insightful. No need to edit it down any further! Thanks, Jan. I’m not sure why they’re burning it. I’m going to have to write more to find out. Such a clever use of words with the ‘skeleton’ trees foreshadowing the body. Good story. Glad you spotted that one, Hilary. Thanks for reading. A touching story full of feeling and unspoken meaning. You’ve made me wonder about what kind of world they’re living in and why they have to do such a task. Brilliant. In my mind it’s a completely normal world, but you’re right it could be out of necessity because of what’s happening in the world. Such an evocative scene – full of feeling and suggestion. It makes me want to know more about the characters and their world. Lovely. Hah! Thanks. Can some of your lack of words be set against my excess words do you think? Thanks, Suzanne. I love how each reader gets something different from the same piece. I hope you enjoy the first chapter – let me know. Very descriptive and evocative writing Claire, and a great use of the prompt. Loved it.